This is a second hand machine, I purchased it mainly for basic internet tasks, wireless networking, the modem is rarely used. I'm running a vanilla 2.6.11.7 kernel, my config can be found here. First I partitioned my hard drive. stuff gets broken, and it's a lot bigger hasle to hunt it manualy later. a solution in giving the graphic card more memory in BIOS, I set it on 8MB and it worked fine ever since. You can find my xorg.conf here. as for setting it up feel free to copy the config from my xorg.conf (which is setup for touchpad and USB mouse). rest of the Internet Zone, see more about it below. For quick changes and easy configuration you can also install Qsynaptics. It's a VIA82cxxx integrated sound device. I just run alsaconf and was ready in a matter of seconds. with music from the hard drive. ethernet adapter from D-Link, it works fine with the pegasus module. 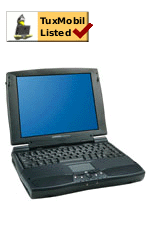 The laptop comes with an integrated Lucent 56k WinModem, detailed instructions and the drivers can be found here. I just unload the wireless card module before doing it (and I suspend it rarely). When I switched to 2.6. * kernel I switched to ACPI also, it works great, and with acpid you can do some neat stuff. 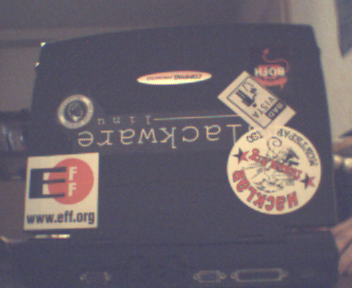 You can find my /etc/sensors.conf here. I purchased a wireless network adapter from D-Link - DWL-650+ that uses a chip from Texas Instruments - acx100. This chipset is fairly supported under linux, guys over at acx100.sourceforge.net are doing a great job. It supports monitor mode so I am able to work with kismet, the connection sometimes stays up for days, it's very stable for such a cheap card. Atheros chips need no introduction... head over to Madwifi project. A friend of mine has some fancy laptop with led indicators of network traffic. So I decided to setup something similar, I installed tleds (read the instructions carefully if installing on a newer kernel). Basicly it blinks keyboard LEDs (ScrollLock & NumLock) indicating outgoing and incoming network packets on a selected network interface. Currently what doesn't work are the Internet Zone buttons, kernel is not mapping them at all, I didn't find a DSDT for my laptop over at acpi.sourceforge.net/dsdt.